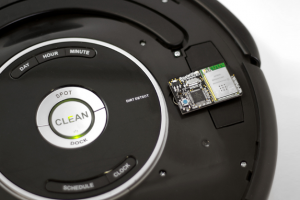 Do you want to develop software to control your iRobot Roomba? Roomba Wi-fi Remote is an easy way to start developing applications that communicate with a device using standard TCP / IP Sockets. User completely forgets about the physical layer and accesses directly the robot through a software developed or not by himself to send the SCI commands to the robot. When Roomba Wi-Fi Remote module is operating and independently of the connection status with web server, waits for a remote connection on TCP port 9001. When the connection is done, the web interface controls are disabled and the Roomba Wi-Fi Remote module becomes a Gateway between application and your iRobot Roomba like through the SCI interface directly. Using the Gateway Mode, Roomba Wi-fi Remote stops being Transparent only when it detects a disconnection from the application’s TCP/IP Client Socket. Roomba Wi-fi Remote uses an auto baudrate configurated link to communicate with the iRobot Roomba. If this value has been modified using the specific command during the Gateway Mode usage, be sure to reboot Roomba with the Clean button or rebooting the Socket to let the iRobot reconfigure the transmission rate automatically. Please read the SCI iRobot Specification because some specific SCI commands put the robot in idle modes disabling the correct operation of Clean, Spot and Dock functions when the buttons are pressed. If you want to manage your iRobot Roomba using the embedded web server remember to close the TCP/IP Socket Client.